TOKYO—On 27 March 2017, Miyashita Park, in Shibuya Ward, was completely enclosed by a series of 3-meter-high steel panels. Since the end of last year, this park has served as a place to sleep for approximately 20 people without shelter and, to the best of our knowledge, nine people were sleeping in the park on the evening of the 26th, just prior to the enclosure. Shibuya Ward initiated construction of the enclosure early in the morning on the 27th and a large number of ward personnel, security guards and police prohibited public entry into the park after 9:00 am. The ward arranged for this blockade, excluding any and all persons from the park, without providing prior notice to the general public and park users, including unsheltered persons sleeping there. The unannounced and underhanded nature of this move is troubling (see note 1 below). At the time of the enclosure, several people sleeping in the park were driven out into the cold sleet. Some who wished to wait until the downpour stopped were shut in by fencing without any explanation regarding the construction, and later offered only temporary accommodation at a doya (flophouse) by ward personnel from the welfare division (see note 2). This kind of welfare “assistance” coupled with forcible eviction, on the one hand, and the loss of freedom of movement, on the other, are both insults to—and violations of—human dignity. In actuality, when viewed from a human rights perspective, public servants working in welfare ought to stand in opposition to the forcible expulsion of people from public spaces, yet, in Shibuya Ward, the welfare division serves as foot soldiers for evictions. The people staying in Miyashita Park at the time of the enclosure declined the welfare officers’ offer of doya accommodation and remained in the park until noon with the intent of protesting. However, the police were mobilized against allies who had gathered to support (and asked to see) persons protesting the sudden enclosure from inside the park. One ally was arrested. Shibuya Ward then had its personnel and security guards closely surround allies in the park (including a staircase leading to the park, which remained unenclosed and open for use), so as to prevent their movement, and for over 15 hours inhumanely prevented them from using water fountains and toilets in the park. Homeless persons and their allies in the park worked together with those outside the park to demand a meeting with the Shibuya Ward mayor as well as a secure, medium- to long-term place to sleep to avoid the rain; negotiations continued past midnight. Ultimately, Park Manager Yoshitake promised in a statement made by microphone that he will negotiate with the Ward’s General Affairs Department to secure a sleeping place from among Shibuya Ward’s public properties. Meanwhile, the delivery of blankets and other necessities for sleeping was delayed by Shibuya Ward’s non-responsiveness, and did not take place until after 1:00 am. More than 12 hours had elapsed since persons in the park had been promised that their personal belongings would be returned after ward personnel removed them from the park at 9:00 am. At present in Shibuya Ward, large-scale redevelopment—commonly referred to as the hundred year plan—has progressed, including in areas surrounding Shibuya Station. As a result, people experiencing homelessness are losing space where they may rest during the day or night. Shibuya Ward Mayor Takeshi Hasebe has, since his time as a local councilor, brought Shibuya Ward closer together with Nike [Corporation], thereby making possible earlier reconstruction of Miyashita Park. Shibuya Ward recently lost a court case advanced by evictees, suing for state compensation following 2010 Miyashita Park evictions. Hasebe succeeded the previous Shibuya Ward Mayor Kuwabara in 2015. 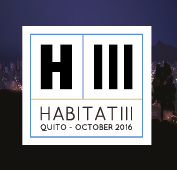 Since he has started his term as mayor, Hasebe has overseen two evictions that, by definition, remove homeless persons from public spaces. It is clear that the diversity and inclusion that Shibuya Ward advertises as part of its own values are no more than superficial lip service and distract the public from a more-concerning reality. On the morning of 28 March, Shibuya Ward tried to start construction of a public space for relocating evictees from the previous day. As the responsible ward personnel refused to explain what was taking place regarding the construction, one of the homeless persons there was arrested. In addition, Shibuya Ward set up obstructions (planters) in a location that evictees had been asking to move to, as it was well-suited to protect from bad weather. Nonetheless, the people evicted from Miyashita Park are now doing their best to secure a sleeping place. We make this statement in anger to protest the actions taken by Shibuya Ward, Shibuya Mayor Hasebe, and Mitsui Fudosan Realty. Shibuya Ward ends all exclusion of homeless persons! Mitsui Fudosan Realty withdraws from the new Miyashita project! Mayor Hasebe engages in discussions with us now! Please express your solidarity with the evicted homeless people of Miyashita Park by send faxes, emails, or call Shibuya Ward directly listed below. Note 1: The park department had posted print warnings on cardboard structures and a storage unit that materials left in the park would be removed. The warnings, dated 25 March, stated that objects had to be removed by 6 April. Also, at a meeting held by the Shibuya Ward Residents` Committee on the Environment, held on 24 March, the park director stated that construction for the new Miyashita project would begin once designing was complete. At present, not only are design plans for Miyashita incomplete, but the broader urban design plans have not yet been determined. Note 2: Many of the facilities used by Shibuya Ward’s Welfare Department do not meet standards established by the Tokyo Metropolitan Government in its Guidelines for the Establishment and Operation of Accommodation Facilities. In addition, in reality, most people entering such facilities, leave due to exorbitant “fees” changed by the facility (taken from the resident’s income from welfare assistance provided by the ward), crowded living conditions (usually in small rooms furnished with bunk beds), and rigid curfews, among other things. Miyashita Park is a park located in Tokyo’s Shibuya Ward, a major commercial center. Many people experiencing homelessness have stayed in Miyashita Park in small cardboard or other structures since the late-1990s. In addition, Miyashita Park has served as a space for organized “outdoor soup kitchens” and other collective actions to protect and preserve the health and interests of homeless persons. In 2009, Nike Japan and Shibuya Ward signed a contract that awarded naming rights for Miyashita Park to Nike [Corporation], and included terms for park reconstruction. The construction was delayed because of widespread protest, and Nike eventually gave up renaming the park in its name. However, in the fall of 2010, Shibuya Ward closed the park to the public after evicting homeless persons staying there. In the spring of 2011, the park was reopened with over half of its space dedicated to new pay-to-use facilities such as a skating park. At night, the park was closed and locked. In the spring of 2015, a court judgment released in the case for damages against Shibuya Ward ruled that the contract between Nike and Shibuya Ward was illegal. In the fall of 2015, Mitsui Fudosan Realty, one of Japan’s three major real estate corporations, decided on a plan to newly build Miyashita Park atop a three-story shopping mall and alongside a 17-story hotel. From the winter of 2016, a campaign to stop the nighttime closure of Miyashita Park began and, since then, 10 to 20 people have been sleeping there nightly. We also installed a storage unit for blankets in the park. Historically, Miyashita Park has served as an important space for survival for homeless persons. It is also an important space where anyone in the city could spend time without having to spend money. However, in recent years, large companies such as Nike and Mitsui Fudosan Realty, as well as Shibuya Ward, have tried to turn the park into a site for commercial profit. In their eyes, members of the public who cannot pay for use of the park, such as persons experiencing homelessness, are unwelcome. We have long decried Shibuya Ward’s attempts to sell the park to the highest-bidding businesses and its disregard for human rights and lives or persons staying in the park. 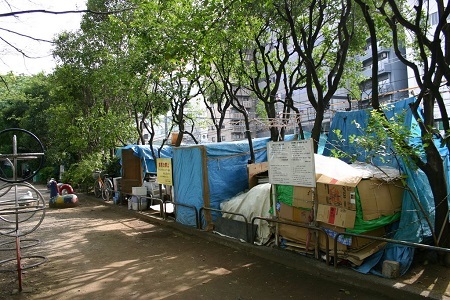 Photo: Homeless people’s shelters in Miyashita Park, Shibuya Ward, Central Tokyo. Source: A Park Life. See HIC-HLRN Open Letter on Miyashita Park: Nike Threatens Local Community Park, Japan and follow-up action.